EC: Taking the Clash to a New Level with TRANSFORMATIONS! Well I haven’t written anything about good old EC in a while, but now is the time to break the long spell of silence. And for good reasons. As the new year approaches and will come, a new era in the Elemental Clash Customizable Card Game will be ushered in. What the hell is a Transformation Card you may rightfully ask. Explaining what the Transformations will be all about is what I will try to explain in this article. And not only will I tell you how the new card type and concept will work, but I will also provide some thoughts on why I think this totally new thing will influence the game as a whole in a beneficial manner and on the potential of the new Transformation cards! First of all, now each player may (it is not a must) have a so called Transformation Deck of up to 12 cards (and no more than 12). These are all “Transformed Creatures”. Each Transformed Creature in your Transformation Deck, which is kept seperately from your Spellbook and never shuffled in with your main deck cards, has two things in its text box to keep in mind: The first is a clause that says “Transforms from X”, whereby X can be a Creature of a certain Element or Creature type or even a specific Creature name. This is the base Creature which can be transformed into a Creature from your Transformation Deck. But you cannot just transform any Creature as you wish, since, secondly, each Transformed Creature has a “Transformation Trigger” also listed in its text box. These are special requirements or conditions that must be met in order to transform a suitable Creature. If you have an eligible Creature and the Transformation Trigger requirements are met, you may take a suitable Transformation card from your Transformation Deck and place it on the “Base Creature” in play. 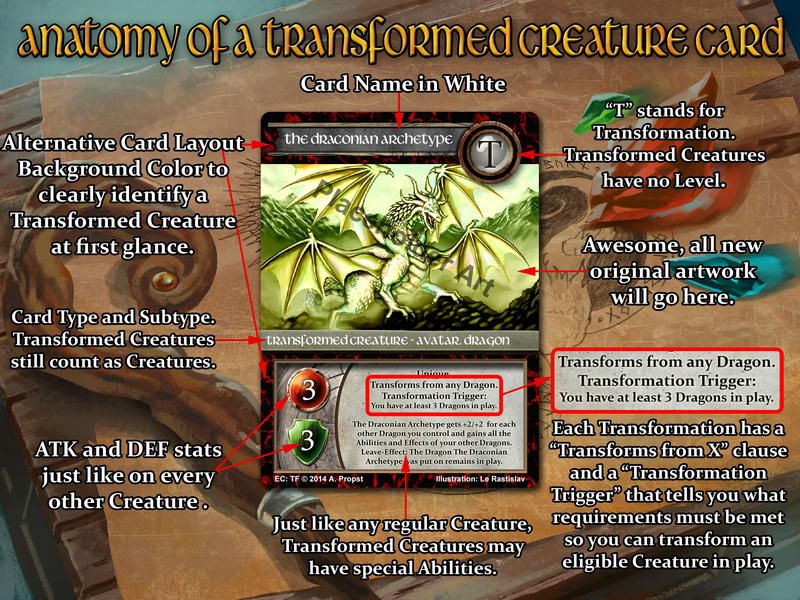 OK so now that we have seen the anatomy of a Transformation card and have seen how transforming a Creature may work, I will show you some more sample previews of Transformed Creatures. Please keep in mind that there will be multitudes of different “Base Creatures” and also diverse ways of how these Creatures can be transformed into more powerful incarnations or alter egos of themselves. So here some more Transformed Creatures. As I do not have any actual art for any of the Transformed Creatures I have planned already, all the artworks are placeholders for now. Asking for your understanding. As you can see in the above samples of Transformed Creatures, their abilities are indeed quite diverse. Bargost Reborn can only be transformed from Bargost (Thundertail) and only when Bargost enters play from your Archive. This is a prime example for the supreme flavor these transformed Creatures can add to the game. You can actually evolve your Creatures and the characters in the game such as the Unique Bargost Thundertail. When he is reanimated from the grave, you can turn him into Bargost Reborn, which is a more powerful version of the already quite powerful, regular Bargost Thundertail. The Avenger of the Skies is one of four similar Avengers – there will be one for each Element – that transforms from any Air Creature and only in case at least 3 of your Air Creatures were destroyed in one turn. And yes, you can also transform during an opponent’s turn. This kind of Transformed Creature can really take your revenge on your opponent. If you have at least 4 Air Creatures in play for instance and 3 of them are somehow destroyed, you can transform your remaining Air Creature into an Avenger of the Skies, which is – as you can see – quite powerful in a Spellbook dedicated to the Air Element. Hellfire Incarante transforms from any Fire Creature as well but only if you have dealt at least 5 damage through Spells or Effects in one turn. This can be a great addition to a Transformation Deck going along with a dedicated “Burn” Spellbook. Startsteel Golem on the other hand transforms only from Gold Golem and only when at least 3 Element-Stones were sent to your Archive from play in one turn. Gold Golem has the Play-Effect to destroy 3 of your Element-Stones, so why not add some Starsteel Golems to your Transformation Deck if you are running Gold Golem Main Deck anyways. But Starsteel Golem only shines when you have various types of Basic Element-Stones in your Archive as it gets +1/+1 for each type of Basic Stone in your Archive. 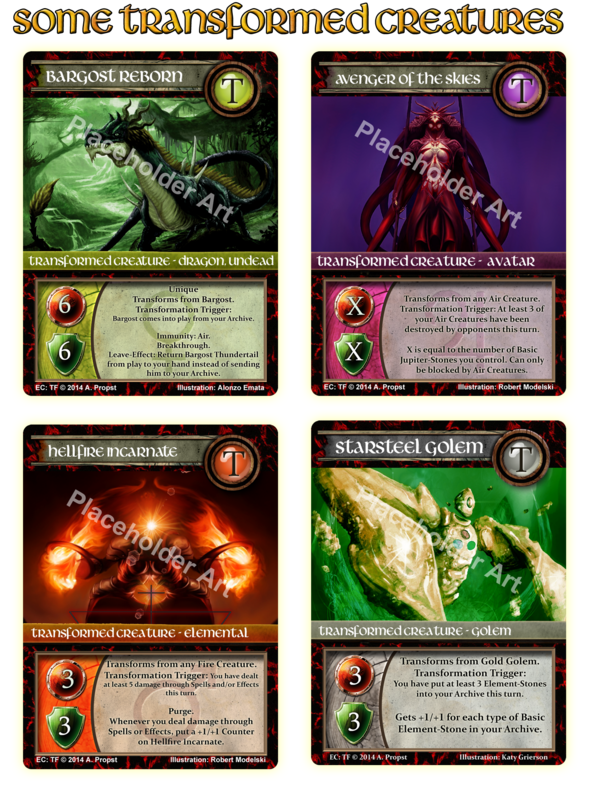 What is not represented in the 4 sample cards shown above are Creatures that transform from a specific Creature type. However I can ensure you that every major Creature type such as Trolls (Earth), Goblins (Fire), Spirits (Air) and Merfolk (Water) among others will get their very own Transformations. All in all I think Elemental Clash as a whole will benefit greatly from the addtition of the Transformed Creatures and the seperate, 12 card Transformation Deck as you may want to tune your deck in ways so as to max out on transforming Creatures. However let me ensure you that the Transformations will NEVER be a must in order to stay competitive and there are bound to be cards in the future that not only support transforming Creatures but also plenty cards that will punish players overusing the new Transformed Creatures. I will personally see to it, that the upcoming Transformations will be balanced and you will have to make clever game moves in order to make good use of the Transformations at all. 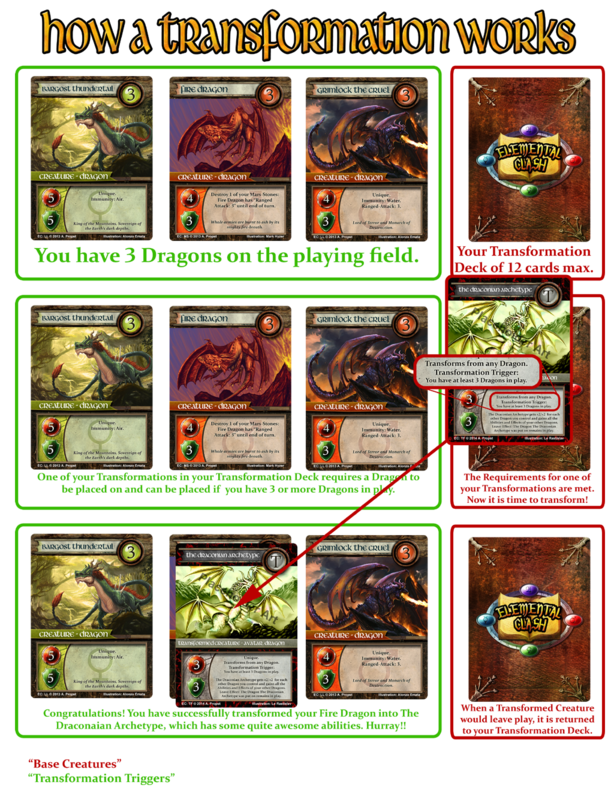 I see the Transformation cards adding a new strategic layer to the game, which will be beneficial for Elemental Clash as a whole, and last but not least, it will add tremendous flavor to the game, as you will be able to “evolve” your in-game characters – just look at Bargost Reborn – which will let you associate with the characters you are running in your deck as you’ll be choosing the path they are going to take. That being said, I can see that there will be various Transformations of some Unique Creatures for example, that will allow you to transform one character mutliple times over the course of the game. A Transformed Creature can be transformed not only once but several times in general mind you. And on a closing note: Some familiar with the Yu-Gi-Oh card game will think I am borrowing a bit from the Extra Deck Special Summoning that has become so popular in that specific game, and these people are not exactly wrong with noting that. I did take some inspiration from the YGO Extra Deck mechanics but tried to be original and do the whole thing my way – Elemental Clash Style. And I think I accomplished my goal with how the Transformation mechanics turned out in the end – requiring an eligible Creature and special requirements being met in order to transform that is. Bottom line: I am very excited about how the Transformation Cards and the addition of the separate Transformation Deck will literally “transform” the game as a whole and I am looking forward to be able to present you the first actual Transformed Creature card previews. The art for the transformed versions of the four “legendary” Unique Dragon Lords from the Legendary Legacy Expansion, Bargost Thundetail, Ascarius Lord of Storms, Grimlock the Cruel and Finborg Sire of the Seas are already commissioned and being worked on so I will be able to present you some actual Transformations pretty soon! Well, dear readers, I hope I was able to raise your curiosity about this new concept to be introduced and added to the Elemental Clash universe and will try to keep you updated on a regular basis! The Transformations begin as the old year passes and the new one begins! This Post was posted in Elemental Clash. Bookmark the permalink. I hope your MIND was being BLOWN in a good sense Nate!! And thanks for STILL paying attention to my humble blog lol!